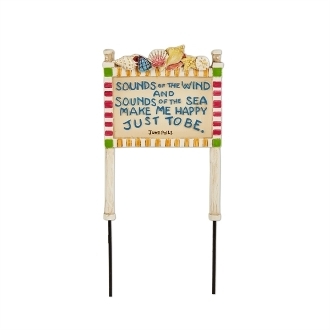 Sounds of the Wind Beach Sign for Merriment Mini Fairy Gardening. Full Description: This beachy sign is the perfect addition to any coastal mini garden. Its message reads "Sounds of the wind and sounds of the sea make me happy just to be. June Polis" Features all-weather paint. Made of resin with metal picks.